The significant difference between the Wattmeter and the energy meter is that the Wattmeter measures the electrical power flows in the circuit, whereas the energy meter measures the total electrical energy consumes by the electrical load. The other differences between Wattmeter and Energy Meter are represented below in the comparison chart. Before knowing the differences between the Energy Meter and the Wattmeter first understands the power and energy. The differences between them and the unit in which they measure. Electrical Power – The power is the physical quantity which shows the rate at which the work completes. Or the rate at which the electrical energy transmitted. It is measured in Watts. Electrical Energy – The capability of any physical system to do any work is known as the electrical energy. It is measured in joules. The Joules (unit of energy) is the product of the watt (unit of power) and time. Thus, we can say that rate of doing work along with the time is the energy. Definition It measures the power flows in the circuit The energy meter measures the energy consume by the electrical load. Unit Measures power in watt. Measures energy in joules. Working Principle Current Carrying conductor place in a magnetic field experiences a torque. Work on the principle of conversion of electrical energy into mechanical work. Driving system, moving system, braking system and counting mechanism are the four main parts of the energy meter. Applications It is used for measuring power in an electrical circuit and for determining the power rating of the appliances. It is used for measuring electrical energy in homes and industries. The meter which is used in an electric circuit for measuring the power is known as the Wattmeter. It measures the energy in watt. The Wattmeter works on the principle that the current carrying conductor placed in a magnetic field experiences a force. The Wattmeter consists two coils, i.e., the current and the pressure coil. The current coil connects in series with the load, and the pressure coil is connected in parallel with it. The measured current passes through the current coil, and the voltage drop occurs across the pressure coil. When the current passes through the current coil, the electromagnetic field develops across the current coil. This strength of the field is proportional to the field coil. Because of the electromagnetic field, the pointer of the wattmeter starts deflecting. The scale at which the pointer indicates after deflection shows the magnitude of power passes through the coils. The energy meter measures the energy consumes by the electrical appliances. It measures the unit in joules. 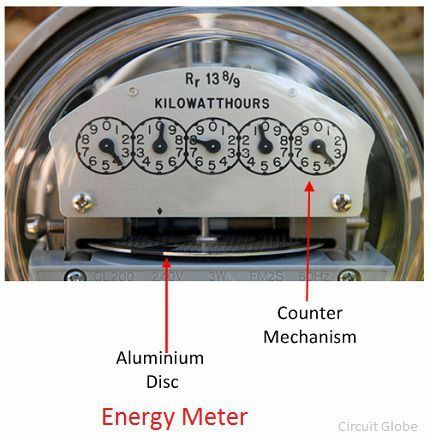 The energy meter works on the principle of conversion of electrical energy into mechanical work. The energy meter counts the revolutions of the aluminium disc whose speed depends on the power consumes by the load at a particular interval of time. The Wattmeter measures the power in a circuit while the energy meter measures the total energy consumes by the load. The Wattmeter measures power in watts, while the energy meter measures the energy in joules. The Wattmeter works on the principle that the force acts on the current carrying conductor when it is placed in an electromagnetic field. Whereas, the energy meter works on the principle of conversion of electrical energy into mechanical energy. The pressure and current coil, control system, damping system, scale and pointer are the central parts of the Wattmeter. While in an energy meter, driving, braking and moving system along with the counting mechanism are the main parts. The wattmeter is used for measuring the power of an electrical circuit. It is also used for determining the power rating of the homes and industries appliances. The energy meter is used for measuring the total power consumed by the load in industries and homes. Wattmeter measures the power flows through the circuit. And the energy meter measures the power consumed by the electrical appliances.